After blooming, this pretty plant turns into an ankle biter. 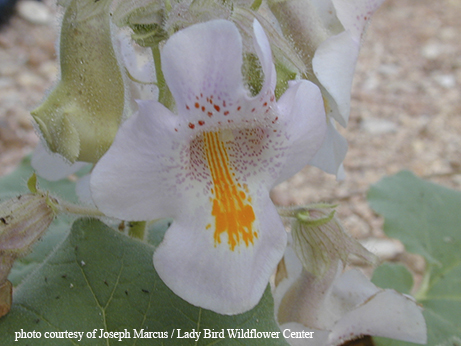 Proboscidea louisianica, an occasional weed of open fields and roadsides, has many names inspired by its unusual fruit. 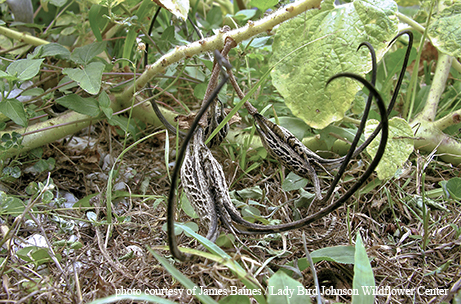 When the fleshy green pods appear in midsummer, it can be called “unicorn plant.” The fruit is crescent-shaped with a long, curved “horn” at the end. The genus name Proboscidea also refers to the elongated structure: think of an elephant’s proboscis (trunk) or a butterfly’s flexible, nectar-sucking mouthpart. Unicorn plant is somewhat uncommon, but can be found in most parts of Texas. It likes sandy soils and full sun, appearing in cultivated fields and pastures, on stream banks and in neglected vacant lots. Some people plant it in their gardens. The flowers are attractive. Young, tender fruits are edible; they can be steamed or pickled like okra. If not exactly pretty, the plant has a life cycle that’s interesting to watch. Unicorn plant is a bushy annual, standing 1 to 2 feet tall. Leaves are 3 to 10 inches wide, heart- or kidney-shaped, usually wavy at the edges. Leaves and stems are covered with sticky hairs and give off an unpleasant odor, described by various gardeners as smelling like rotten soap, gym socks or armpits. Flowers appear from June to September, sometimes earlier, with five petals fused into a tube at the base. They’re typically white, pale pink or lavender, with purple or brown freckles and a yellow stripe on the lower middle lobe. One subspecies found in Texas produces deep magenta blooms. A plant may produce up to 20 flowers, but only a few will open at one time. As summer progresses, it’s not unusual to find flowers, developing fruits and mature pods on the same plant. Is unicorn plant a pest, a wildflower or a useful crop? It depends on your point of view. However you choose to describe it, chances are that P. louisianica, with its unusual and effective seed-dispersal system, will keep popping up. Size: Bushy foliage grows 1 to 2 feet tall. Did You Know? A proboscis is a long, tubular organ.